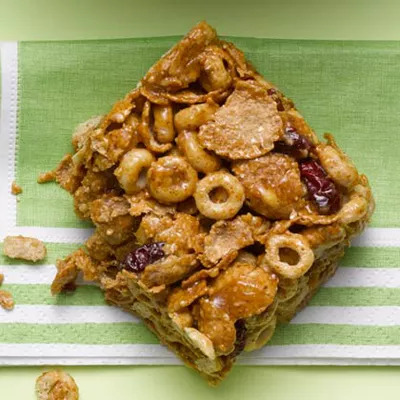 No need to buy expensive store-bought cereal bars! You can make healthy ones at home in almost no time. These bars have just five ingredients, including almond butter, a great alternative to peanut butter. One tablespoon of almond butter provides 32% of your daily recommended intake of vitamin E, and the tart cherries in these bars offer a good source of vitamin C.
They're a great way to start your morning or eat them as on-the-go snacks. (You can even freeze them for a cold treat!) These almond cereal bars are 144 calories a serving, with less than 1 gram of saturated fat. Ingredients: almond butter, honey, whole-grain cereal flakes, oat and bran O's cereal, unsweetened and dried cherries.